To catch up or see other short stories check out the Short Stories page. I hope you enjoy! Two weeks passed in Lilith’s basement. Two weeks of planning and fighting about the plan, and coming up with a new plan. I knew the layout of heaven like I knew the back of my hand. I knew every exit, every entrance, and every secret path way. Gabriel knew everything about heaven, and the few things he didn’t, Naolin and Lilith could fill him in. We had a plan, a backup plan, and a backup plan for the backup plan. My head was filled with twist and turns and possibilities. It was the only thing we ever talked about, even Tessa kept her normal ramblings to a minimum. I was tired of planning. I was tired of talking about what we were going to do. I was ready to get out there and get things done, but Lilith wanted everything perfect. The only problem was, none of us knew what Lilith planned to do after we had freed heaven. We were going in to free Michael, who would then help us free the rest of the angels. Lilith said she would take care of things after that. I didn’t trust the demon. “No, you have to take this path first.” Lilith said again, pulling my attention to the map of heaven. “I think you are mistaken. That path leads right to the dungeon where Lucy is being held.” Naolin argued. Lucy was Lucifer. All the books got it wrong, saying Lucifer was a male angel. Lucy was all female, but no one had ever really seen her. “Why is that?” I asked. I knew there was a reason I didn’t trust Lilith and she was starting to crack. Everyone being trapped in this little room together was driving us all a little mad. “Because Lucy is my mother!” Lilith shouted. “By destroying all humans?” I let Naolin pull me away from the argument. “I think we need a break.” Naolin said, her voice soft. I almost didn’t hear her over the boiling of my own blood. Lilith was willing to release the one person with the strength and nerve to send Earth into total chaos and destruction, just to get back at her past lover. It was stupid and made no sense. I followed Naolin outside and took a deep breath. My lungs filled with the cool air of the night and the light of the moon eased my anger. “She is being ridiculous.” I said. I had tilted my head to the stars, not looking at Naolin. I didn’t want her to see the anger in my eyes. I didn’t want to see how she looked at me now that I had lost my temper. I thought several times that she may be falling for me, but after tonight she would only hate me. I am a demon, and one thing that is true about us is that we have very short tempers. 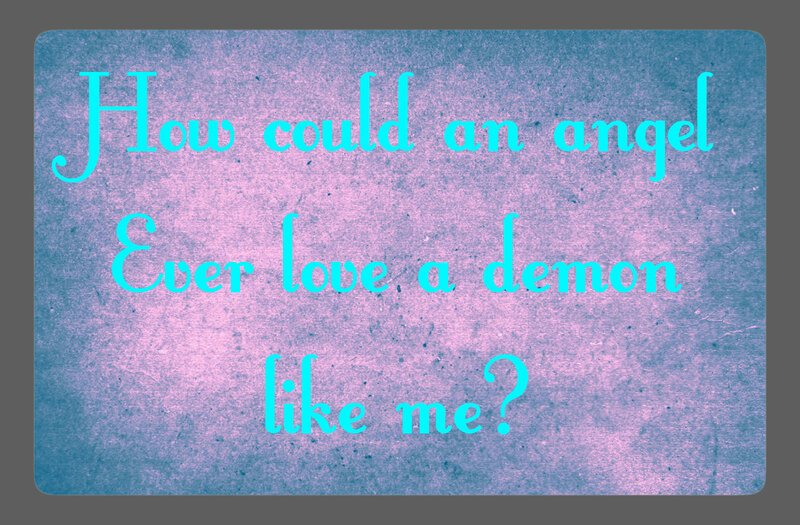 How could an angel ever love a demon like me? “It’s not that.” She said as she pulled away. “Why are you crying?” I asked, my heart was beating faster than a hummingbirds wings. I was suddenly afraid of what she was going to say. “The only way?” I stared at her, not sure what to say. “Even if that demon has a short temper?” She pulled away from me and placed her hands on my face, pulling me down. Before I could comprehend what was happening, her lips were on mine. They were as soft as I had imagined. The world could have ended in that moment and I would have gone happily. She pulled away and smiled at me.